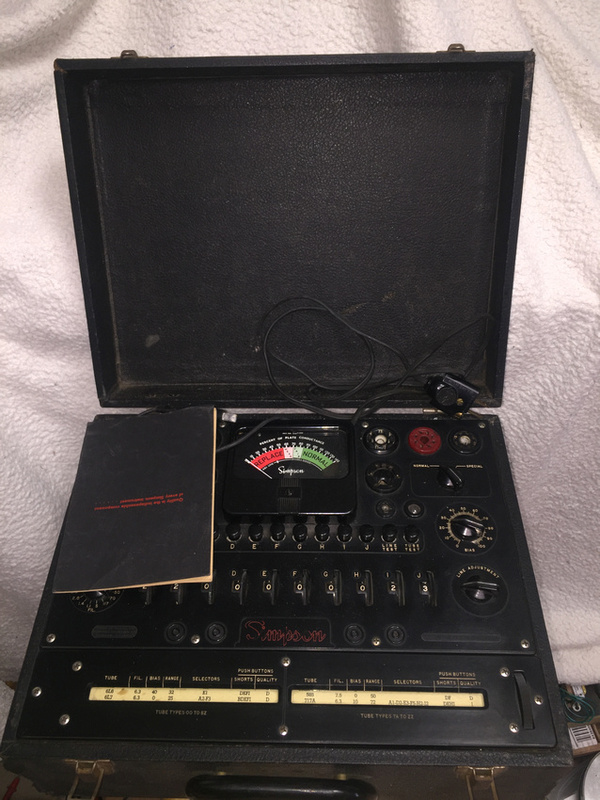 I've got a almost new looking Simpson 303 VTVM that's giving me trouble on all settings.I tried to use it a few days ago and it was very erratic. Ohms didn't work at all but the battery was not installed so that explained that. I changed a couple of Pyramid brand "black beauty" caps and one very tired electrolytic cap. 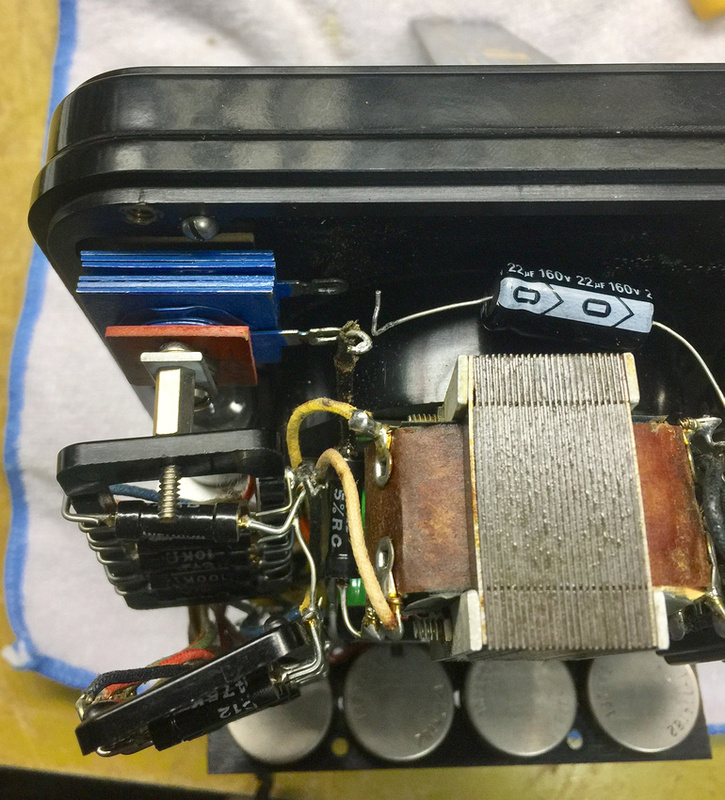 But left the selenium rectifier in place. Ω - Can't zero the meter. Ohms adjust works but it seems "spongy"
There is about 64VDC on Pin 1 and 6 of the 12AU7. Schematic of the power supply section. It's hard to solve an equation if every term is an unknown. It sounds like the selenium rectifier wasn't rectifying. Defective rectifier. That's why all the drifting readings. AC leakage though out everything. 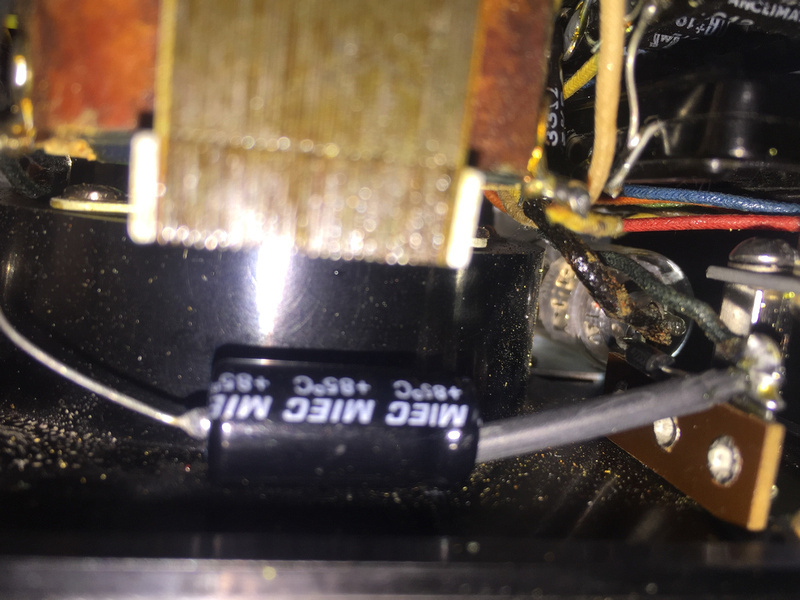 DC filter capacitor don't like that. Well... 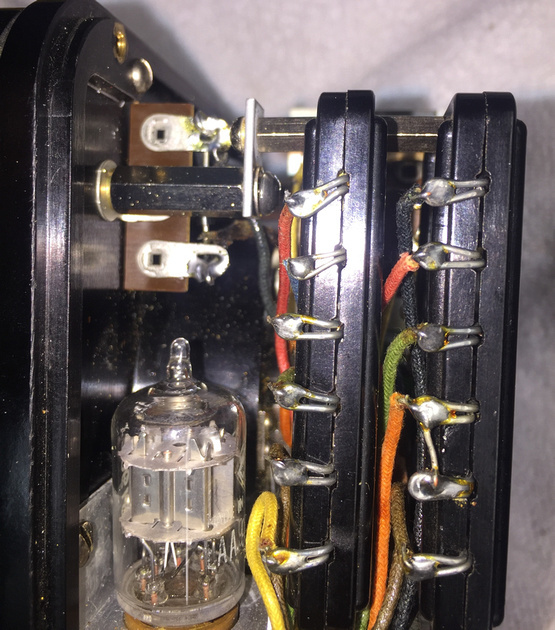 Since new electrolytic caps don't blow up unless they are installed backwards (this one did) or some kind of over voltage event occurs, It was probably installed backwards. So, I installed a new cap oriented with + on the rectifier. DC+ works. It's not accurate but it works (off about .5V at 6V). DC- is off about the same amount. Resistance works and it's pretty accurate at 100kΩ. I haven't checked AC volts yet but I think I'm down to doing calibration. I may swap that selenium rectifier out. I hate to, It looks brand new. It'll be nice to have a portable VTVM. Here it is out of it's case, in case, and case closed. Even if that wasn't the problem it sure could be. I'm going to change it. I guess a 1N4007 will work? Drawing in post shows backward E-Cap. C4 - red should be + red. A 1N4007 diode is fine to use. 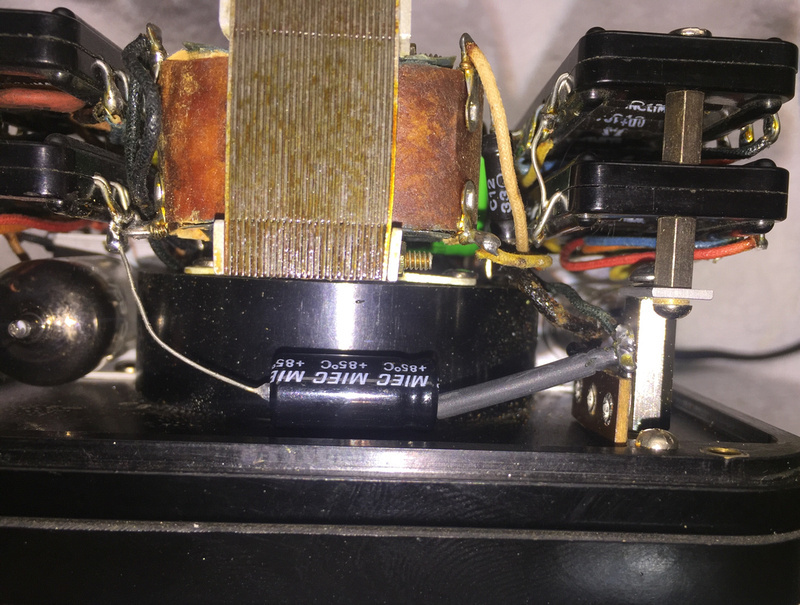 However may now need dropping resistor in series with new diode before filter capacitor. Read B+ and adjust value for correct B+ level. They'll blow if you feed them AC due to a defective rectifier. That effectively runs them backwards for part of the power line cycle. And don't worry about a dropping resistor. 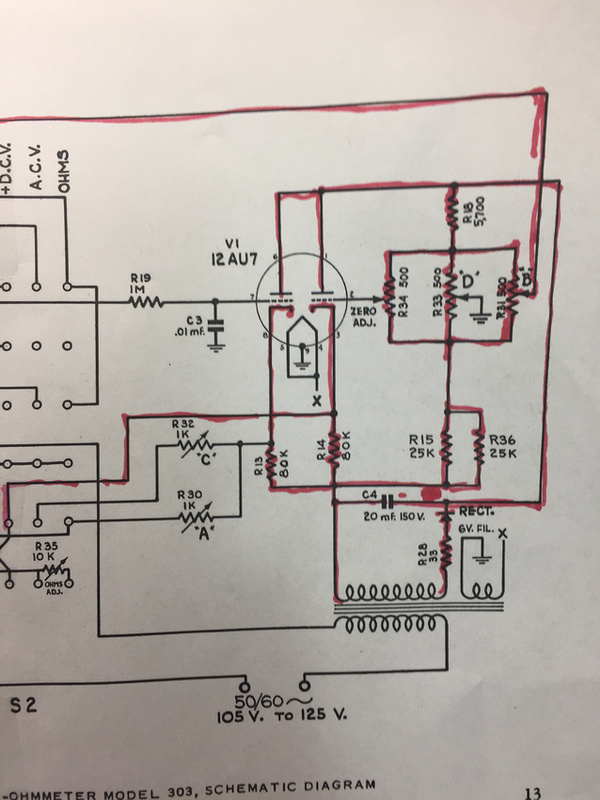 The current draw of the circuit isn't enough for there to be much drop through a properly functioning selenium rectifier, so substituting a silicon diode isn't going to affect the B+ very much. A few volts won't matter. OK... the selenium goes. Even if it's good now it needs to go. It's pretty enough that it will make a nice bench ornament. Now I wish I would have pulled it when I had it apart for re-capping. They stuffed a lot of things into the case so getting it again will be fun. I like the way that they mounted the resistors. When I get the case open I'll try to remember to grab a photo of it. The 303 is a great little meter, even if the probe connectors are scarce as hen's teeth. Talk about 5 lbs. of stuff in a 4 lb. bag! I still remember the "fun" of replacing those two caps buried deep in the middle. 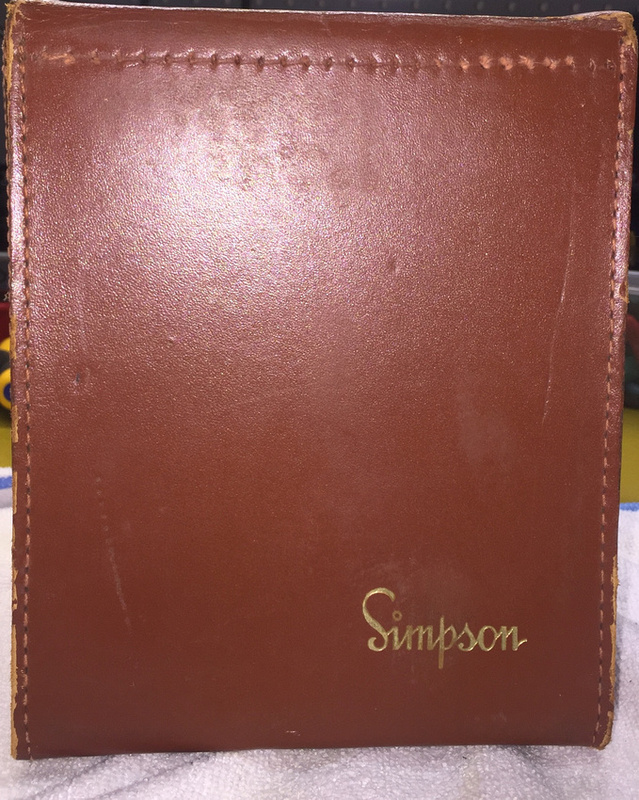 Even so, ya gotta love Simpson's build quality. 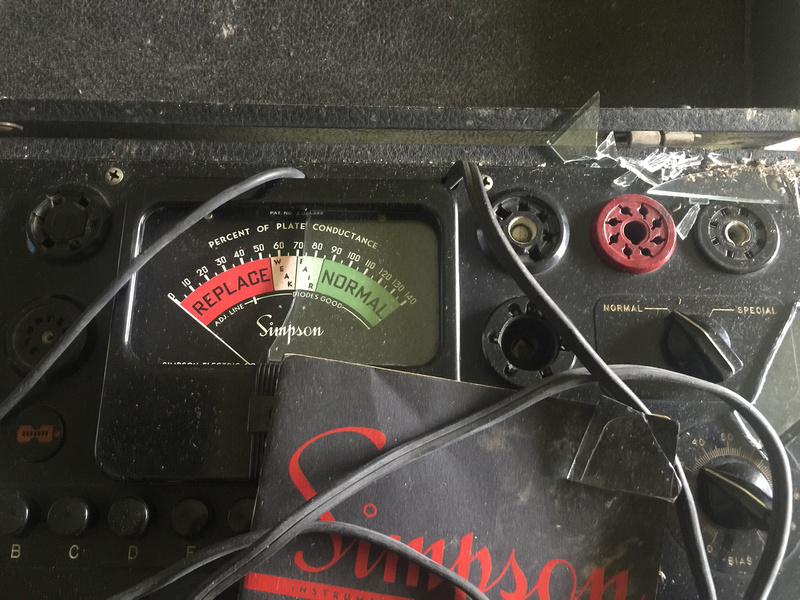 I guess that's why I'm still on the lookout for a Simpson 330 tube tester, even given its less-than-stellar reviews for useability. I have a 335 with a busted meter glass Chuck. I haven't touched it and don't know when I would. I've got 4 tube testers, oops, 5 counting the µTester. 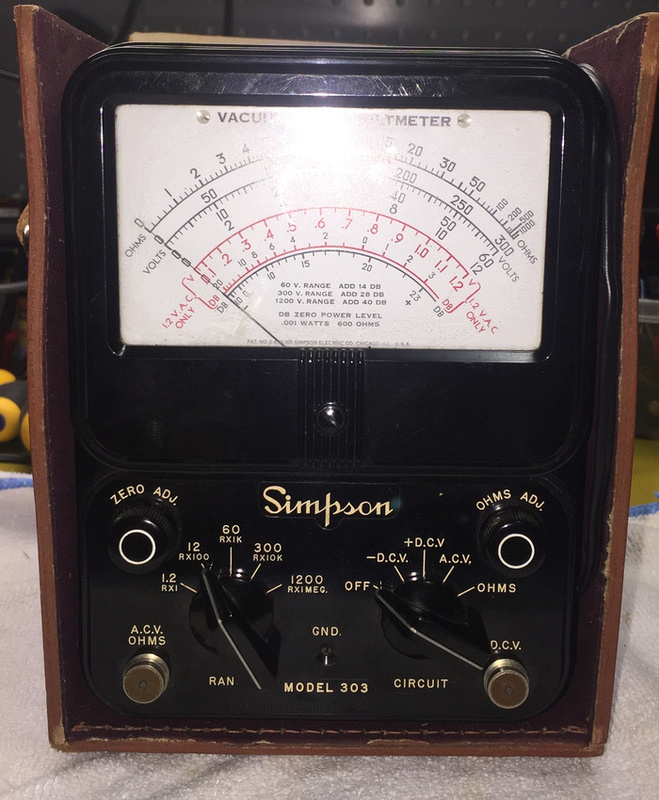 Two Hickok, one EICO, and the Simpson so I'm good with tube testers and wouldn't mind seeing the Simpson go to a good home. The goof that I bought it from closed the top on the power cord and stuffed it in a box to ship otherwise it would have been perfect. I was not happy... Other than that I think it's in pretty good shape. Needless to say, PM sent! Here's a real quick phone picture. 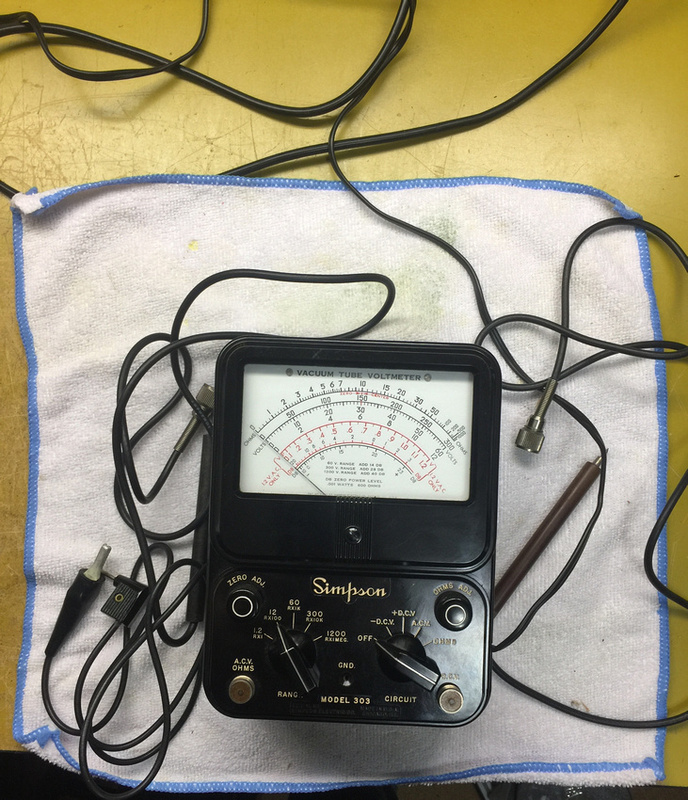 I finally got the parts in to finish the Simpson 303 diode install. I bought a 6-32 x 0.750" standoff. I think I should have bought a 0.625" standoff but the 0.750" works. It's hard to get a good shot of the diode install but here's a few different angles. Basically I replaced the stud that went through the selenium with a standoff. The threads were a little long so I had to use a washer between it the standoff and the terminal strip mount. That raised it up about 1/8" and that is about how much too high it is. Simpson sure didn't waste any space in there. It's kind of like trying to work on anything in the engine compartment of a modern car. Working on an old Hickok 209A or 288X is much more like working on my old '59 Chevy - plenty of room to maneuver. Maybe I'm missing something, Mike, but why can't you shorten them? Screw on a nut, hacksaw to the desired length, then unscrew the nut to clean up the sawn end of the threads. Then as the fellow from down under on eevblog says, "Bob's your uncle!" If you're not in a hurry, I can check my stash tomorrow morning. I have a whole assortment of standoffs and will be glad to send you a pair if I have the right length.